Forza Motorsport - Forza Horizon 4 -- Route Creator &amp; More! 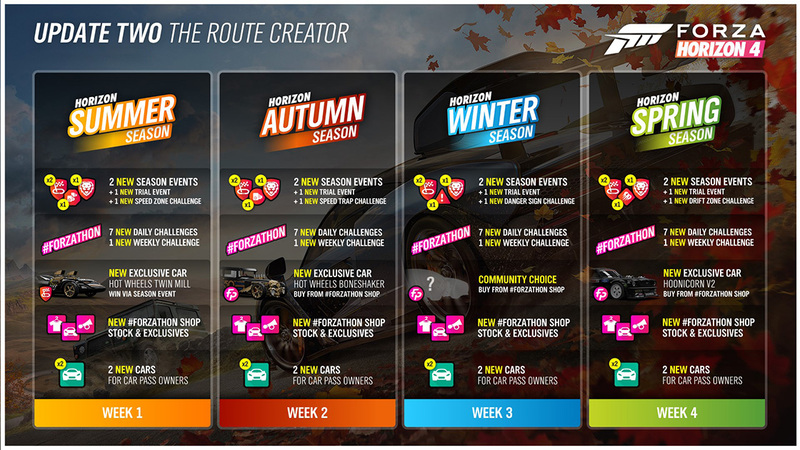 Forza Horizon 4 -- Route Creator & More! Announced at the Xbox Launch event for Forza Horizon 4 at Goodwood, the Route Creator feature has arrived in Forza Horizon 4 with the latest update. For the first time in Horizon history, you can now create new race routes simply by driving them, setting checkpoints as you go with just the press of a button. These routes can be up to 40 miles long and can originate from any Asphalt, Dirt, or Cross-Country Event start location. British car culture is legendary and now’s your chance to be a part of it. The new Horizon Story, “British Racing Green” casts you in the role of helping to produce a documentary on British automotive history by driving some of the country’s most famous cars. Along the way you’ll be challenged to maintain your speed across various routes in a variety of Britain’s best vehicles. Complete this adventure and you’ll unlock new goodies, including a new Quick Chat phrase, a new clothing item, and the classic Bentley 8 Litre. In addition to the new features, today’s update also includes new fixes and improvements to the game, including engine audio improvements across multiple cars based on feedback from the Forza community. The team has added the option to quit Quickplay Team Adventure after finishing an Adventure, and has improved stability and performance across both Xbox and Windows 10 PC platforms. For a deeper look at the fixes and improvements arriving with the latest update, check out the latest Release Notes on the Forza Support site.